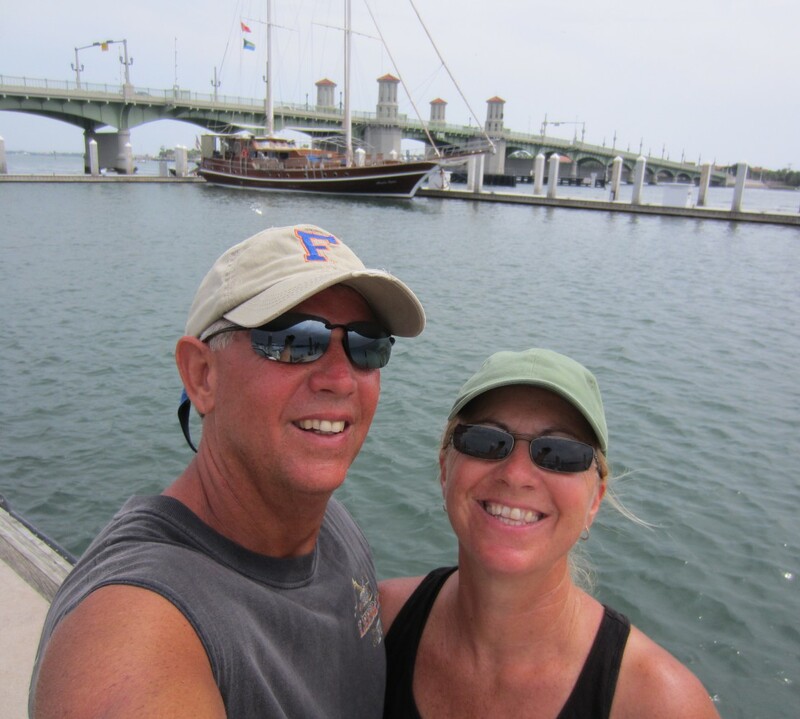 We have been very busy the past few weeks, with land, air and sea adventures from our winter in Boot Key Harbor. I spent the last week of January and the first week of February visiting grand-babies and their parents in California. The temperatures were a little chilly for this Florida girl, but visits trump cold weather when it comes to Nanny getting to visit grand-babies. And this from the main reason for my trip to California…Gabby’s baby dedication. The Captain dropped me off at Miami International Airport on his way to the house, where he gathered up all boat related items we weren’t in need of and returned to Boot Key Harbor. Between the morning net and the Saturday morning flea market, he was able to thin out the excess substantially. Another flea market is on the horizon and we are hoping to share what is left! My flight home had a three hour lay-over in Atlanta, so I convinced this guy to come and visit me for a little while. It was really great to see Benito! Of course cleaning out means that there is more room to buy things at the boat show (just kidding) but, we did go to the Miami Boat Show. We were able to get a hands on on look and good pricing on our next big priority for setting up No Ka Oi for the cruising we have planned. Our next priority was weather acquisition when we are away from our current means of acquiring reports. We decided SSB radio communications would meet our need the best, and we will be receiving our unit in a week or so (stay tuned for the installation details.) We also checked on other items we were interested in for the future, exchanged a grill light that wasn’t working and picked up a nice rain jacket for a great price. We also caught a weather seminar by Chris Parker, it is good to have a face to go with the voice. It was a long day, but we had Georgette and Gary to share the ride and day and a great meal at Mario’s in Homestead on our return home. The weather has been just beautiful and we went kayaking around the harbor. Have I told you how much we love living in paradise? Valentine’s Day was quite relaxing. We picked up breakfast at the Harbor Hillbillies and took it over to the marina tiki to hang out at the brunch pot-luck, without having to cook anything. I’m perfecting K.I.S.S. The wind laid down and we found a sunny spot overlooking the ocean to hang out for the afternoon, followed by a scrumptious dinner of steak with mushrooms, baked sweet potatoes and cauliflower, with a pretty sunset and our favorite Valentine’s movie, Sleepless in Seattle, it was a fine day. In other news, the tree that was struck by lighting over the summer finally came down. Fortunately it was by a tree service and not a strong wind. We are thankful to have wonderful children to oversee the project and are especially thankful that it came down safely. The Captain took advantage of a sunny afternoon, with a light breeze to put up our new sails. With the weather we have been having, we hadn’t had an opportunity to make sure everything fit properly. All seems well and we are looking forward to getting off the mooring ball for a nice sail real soon. We are ramping up our provisioning as we look to head out to the Bahamas in the next couple of months. We are challenged with the space limitations we have and want to be wise in taking items that won’t be easily obtained, like spare parts or certain foods that we prefer. We are using our mobile storage shed (i.e. our van) to help us organize and accomplish this task and asking lots of questions to those who have gone out before us. Stay tuned for more provisioning lessons learned. We hope you are enjoying a beautiful week wherever you are.